Preheat the oven to 350F. Generously grease 24 standard muffin cups or line them with disposable muffin wrappers; set aside. Add all the ingredients except the 'add ins' into the bowl of a stand mixer fitted with a paddle attachment. Mix at medium speed just until the ingredients are combined and not lumpy. Stir the remaining 'add in' ingredients until combined. Using a large-sized scoop, fill the muffin cups about 2/3 full with the batter (one scoop of batter per muffin tin). The batter is enough for 24 muffins. Bake the muffins in the preheated oven for 12 to 15 minute, until lightly brown and the tops spring back with touched. Serve warm, toasted or if you must, a dollop of sour cream. Thanks to Amanda for selecting this week's PPQ baking challenge. Hopefully others who tried this recipe enjoyed it as much as we did. Please check out Amanda's blog for the detailed recipe and be sure to take a peek at fellow PPQer's to see how their recipe came out! Oh lovely! It's been in the back of my mind to look for a good, hearty, hunky cornbread recipe! Thanks for sharing! Bacon makes everything better! Great interpretation! Yum, they look and sound delicious! These look super! 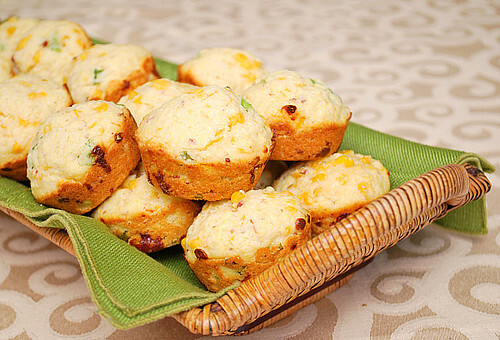 Who wouldn't love all the extras (hello bacon) in cornbread muffins?